Here’s Rick Nolan, your representative from CD8. 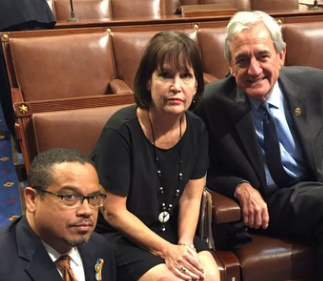 Banana Republicans (from L): Keith Ellison, Betty McCollum, and Rick Nolan. It was taken this past Wednesday, as he participated in a “sit-in” on the floor of the House, in favor of a bill that would have gutted due process by allowing the government to bar firearms from anyone on a “terrorism watch list” that government can put people on with no due process, no accountability, and no recourse. All government has to do is put your entire group – pro-lifers, hunting rights groups, even union activists – on the “watch list”, and boom; no guns for you. And there’s nothing you can do about it. Just like in the Soviet Union, Saudi Arabia, or any banana republic. This is what Rick Nolan is spending his taxpayer-funded time and money on in DC; pretending that you, the people of CD8, want this country to turn into a banana republic. This entry was posted in Big Gun Control, Big Left and tagged MN CD8, Open Letters by Mitch Berg. Bookmark the permalink. -A dim bulb who called me a “Teabagger” on her web site (before someone on her staff told her what that means and removed it). But hey, using a government enemies list to remove your constitutional rights is fine as long as your side is making the list up. Duluth Democrats know a thing or two about putting the screws to those who don’t submit. Example? If you are an electrician who is an independent contractor, so you do not belong to a labor union, you always have a bit more trouble getting the city inspector to approve your work than those who carry a union card do. Its a subtle form of harassment that is hard to prove in court. Rick is at least smiling for the camera.